The understanding and treatment of infectious and other externally-contracted diseases has been a central concern of Chinese medicine for millennia. Especially during the past few centuries, the concepts and treatment approaches of the warm pathogen disease school have percolated throughout Chinese medical thought. Modern practitioners apply them in the diagnosis and treatment of a wide variety of serious illnesses, including many which are common in the West, such as auto-immune disorders. Warm Pathogen Diseases: A Clinical Guide (Revised Edition) provides an in-depth, clinically oriented approach to this important subject. 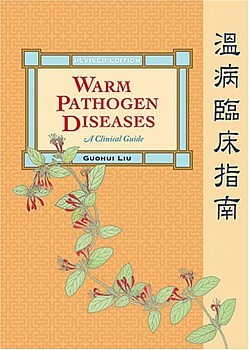 The introductory chapters tell the compelling story of how traditional Chinese physicians, primarily from the seventeenth through the nineteenth centuries, developed the theories and concepts of warm pathogen disease in response to the health crises of their time, which included a number of epidemics. The evolution of their approach to aetiology, pathogenesis, diagnosis, and treatment, discussed in this volume, demonstrates how traditional medicine has evolved to meet contemporary needs. The second part of the book describes the various types of warm pathogen disease from a clinical perspective. Here the author discusses the manifestations, pathogenesis, treatment principles, and formulas for each type. Case histories show how theory is actually applied in the clinic. A variety of approaches is presented, which avoids the tendency to portray traditional Chinese medicine as an unchanging, monolithic entity. Over time, these differences have led to much creative foment and improvement in the efficacy of treatment. The author also addresses aspects of dosage and preparation that are generally omitted from standard textbooks. This part of the book will be particularly welcome to practitioners, who will find it useful in the clinic. Rounding out the volume is an extensive bibliography of original source materials, supplemental case histories and materia medica, and detailed indexes which provide access to every aspect of this subject. The changes in this edition include updating both the pharmaceutical and pinyin names of the herbs, formula names, addition of tone marks to herb and formula pinyin names, and new translations of book titles. There are also a few changes in terminology, most notably, warm disease is now warm pathogen disease, and warm-febrile disease is now warm-heat pathogen disease. ‘I warmly recommend this book to anyone interested in warm diseases. For the foreseeable future it will be the definitive English language textbook on the topic, but it is more than that ... a guide into a field of medicine that no serious practitioner of Chinese medicine should be without.’ - Foreword by Volker Scheid, Ph.D.
‘Warm Pathogen Diseases: A Clinical Guide is the best English introduction to warm disease theory to date. Liu’s scholarly interests and clinical abilities equip him well for the task of portraying the deeper strata of Chinese medicine, and his mindfulness about the psychology of the Western reader makes this an entertaining work that goes well beyond the common approach of the Chinese medical textbook translation’ - Heiner Fruehauf, Chair of the Department of Classical Chinese Medicine, National College of Naturopathic Medicine.